You use the Print tool to print a map in ArcMap. This sends your map to your desired printer. Here are the steps for printing the contents of the active data frame. This will print the existing display as shown in the current map extent of your data frame. Make sure that you are working in Data view in ArcMap—either by selecting View > Data View in the main menu or by clicking the Data View button in the lower left of the map canvas. Pan and zoom your data frame until you have the desired map extent. Click File > Print on the main menu, to print your data view. The layout is the map view that arranges various map elements onto a page for map printing. 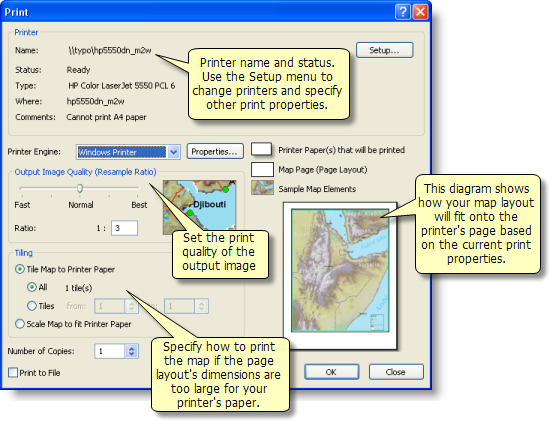 Here are the steps for printing the layout view of your map. Make sure you are working with the Layout View in ArcMap—either by selecting View > Layout View in the main menu or by clicking the Layout View button in the lower left of the map canvas. Click File > Print on the main menu, to print your layout. From time to time, you may have the need to print a map whose layout page size is larger than your printer—for example, you may only have access to a document printer instead a large format plotter. Or you may want to create a huge wall map. 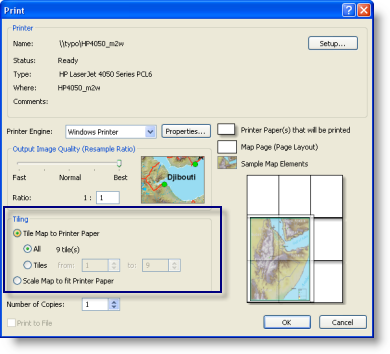 You can select Tile map to Printer Paper to tile the map into a number of pages for printing. You can select Scale Map to Fit Printer Paper to fit the map onto your printer paper. In cases where you will print maps as multiple tiles, it's helpful to create a test plot first. For example, you can print just a few tiles or create a simple layout with an empty data frame and a few other map elements. See About map printing for more information. There are a number of maps that you'll work with, which will contain multiple pages. For example, suppose you want to generate a map book (say to assemble a Tax Map book or a book of Emergency Response maps of your jurisdiction). In these cases, you can use an ArcMap capability called Data Driven Pages. This uses an index dataset where each feature defines the map extent for a specific map sheet. The attributes of the feature specify some of the map element properties for each map page (such as the map title or the filled area of interest that is displayed on an index map). Using Data Driven Pages starts by setting its use on the page and print setup dialog box and then defining how attributes will be used in page generation. For more information, see What are Data Driven Pages?